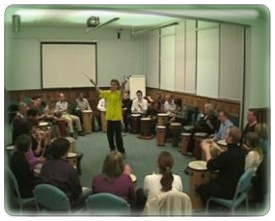 A 9 minute video showing an overview of a drumming workshop style activity. How to be...rhythmologised! 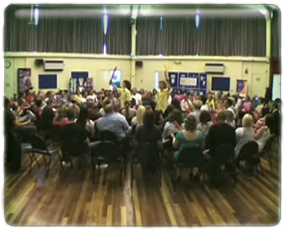 A 3 minute video with highlights of a Massed Boomwhacker activity for a business away day or conference energiser. 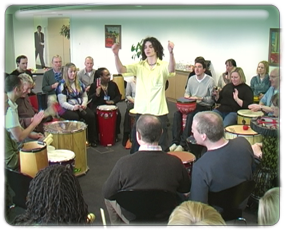 An 11 minute video taken from an away day for The North West Government Office featuring warm up rhythm games, a drumming workshop and drum circle finale. 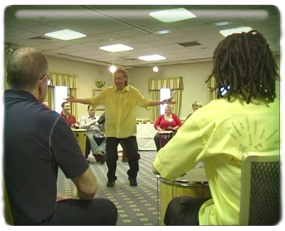 A 7 minute video with clips from an hour long drumming workshop for a Barclays Bank team building day in Cheshire. 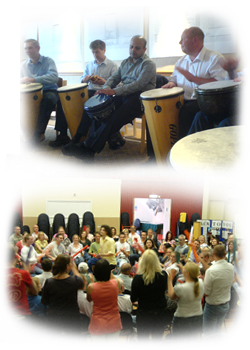 Our activities are fun entertainment that include all your guests - they all take part in the drumming or Boomwhacking and make up their own music as they go along. It is easy to do so all enjoy the exciting atmosphere and burn off a few calories while working together as a team to make solid rhythms.